A full day of celebrations dedicated to Made in Italy design: this is the “Italian Design Day”, announced last year by the Italian Ministry of International Affairs and Cooperation, whose first edition will be held on March 2nd, with a calendar full of events and happenings in hundreds of cities around the world. – On March 2nd, Mr Massimo Roj, CEO of Progetto CMR, will be at the University of Architecture in Ho Chi Minh City at the event “Italian Design Days – The Art of Lifestyle”, organized by the Italian Consulate in Vietnam, where he will first talk about one of the latest chairs designed for Poltrona Frau, followed by an in-depth analysis on sustainable urbanization and the Italian approach to achieve it. On the same day, the Italian Institute of Culture in Beijing will host “Italian Design Day – Vivere all’Italiana”, where a selection of Progetto CMR main works will be displayed. 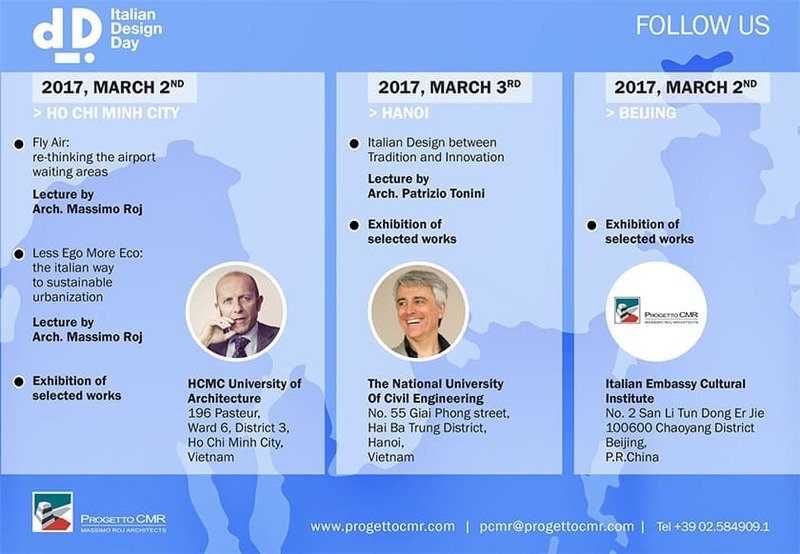 – On March 3rd, Mr Patrizio Tonini, Senior Associate and Design Director at Beijing office, will attend the “Italian Design Day: Crafting Creative Italian-Vietnamese Partnerships” event in Hanoi, organized by the Italian Embassy in Vietnam and held at the National University of Civil Engineering, sharing his ideas on the topic “Italian Design: Between Tradition and Innovation”. Follow us on our social networks for more updates!